This website is for CAMRA members that have an interest in the West Kent Branch. The branch area includes the towns of Edenbridge, Sevenoaks, Tonbridge, Tunbridge Wells and Westerham. The easiest ways to help CAMRA West Kent? The number 1, easiest, but most important thing that CAMRA members can do to help any branch is to enter pub and beer scores via WhatPub. If you enter scores for pubs that you try they will get fed back to the relevant branch, and will be used for deciding which pubs go in the Good Beer Guide. The menu on the left contains a guide to Beer Scoring, or follow the WhatPub link above to go direct. We’d also like to recruit a branch ACV Officer to spearhead applications for Asset of Community Value status to threatened pubs in the branch and support local community groups in applying for ACVs. In fact we really need more active, campaigning members on the branch committee to spread the workload generally. We’re all volunteers as you know, so if you want to be more involved let us know or come to our branch meetings and get involved. Yes folks its nearly here! 150+ real ales, cider, green hop bar, UK craft and European craft bar. With the launch of the Good Beer Guide the branch gets to hand out some awards to some of the hard working people in our branch pubs. Some of the most impressive awards go to pubs with many consecutive years in the GBG. Pub of the Year 2018 goes to The George in Tunbridge Wells. Manager Paul Fillis was delighted to receive the news from West Kent CAMRA Branch chairman, Craig Beeson. Paul recently hit the news thanks to the opening of a microbrewery in a downstairs room of the pub, where he doubles up as head brewer, producing small batch quantities of real ale to sell in the bar upstairs under the name Fonthill Brewing Company. At the moment the brewery is trying out a range of recipes and they seem to be receiving very favourable comments from customers. The pub has eight hand pumps, two of which are dedicated to real cider, whilst the other six offer a changing range of ales from far and wide. Runners up were the Weald Windmill in Sevenoaks Weald and Fuggles Beer Cafe Tunbridge Wells, both themselves previous winners. 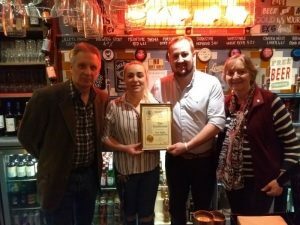 Cider Pub of the Year 2018 goes to The Pantiles Tap – Serious About Brilliant Beer, in the Pantiles, Tunbridge Wells for the third year running, thanks to its mighty “Great Wall of Cider” offering cider and perry from a wide range of producers. 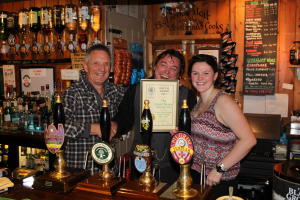 West Kent Club of the Year 2018 goes once again to the Tunbridge Wells Constitutional Club, where club members and sometimes CAMRA members can enjoy a particularly tasty range of ales from four hand pumps, along with a friendly welcome of course. We have also added a seasonal award for Most Highly Commended Pub. 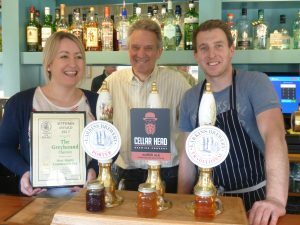 This will only be awarded when a pub has come on to our radar as being really worth a visit, the beer must be in top condition, but the management and staff are the real winners because of what they have achieved. 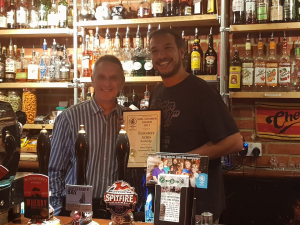 The first winner of this award is the Foresters Arms in Tonbridge WHATPUB LINK Congratulations to Tyson and his team on turning this pub around, its now a popular community pub, serving great beer (including a guest), and the pizzas are a hit as well. The Greyhound Charcott was he 2nd winner of our pub of the season award. Fran and Richard have not only made the perfect pub, its there home as well. Its very unusual to see a pub get back on its feet as quickly as the Greyhound, and lets be honest its exceed all our expectations. Fantastic beer, matched with excellent food, possibly the best sausages around!! Make sure you also try the cheese from the farm just down the road. Our branch is extremely grateful when members inform us of a pub that has really upped its game, beer scoring on https://whatpub.com/ is one way to keep us up to date, but social media or just having a chat with us is also greately appreciated. 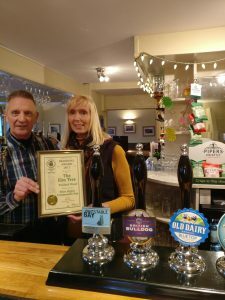 The Elm Tree in Paddock Wood https://whatpub.com/pubs/TTW/96/elm-tree-paddock-wood is one such pub, and we are over the moon when they were nominated for our seasonal award. 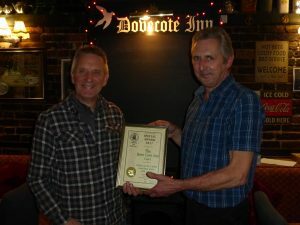 The Gatehouse in Tonbridge is another pub in Tonbridge to be recognised for its beer range and quality. Many members are now including it in there nights out in the town, it has also hosted several meet the brewer events. Dovecote Inn Capel. 20 years in the GBG!! WHATPUB LINK The Dovecote is one of my favourite pubs to walk out to from Tonbridge, and you have some great great real ale (on gravity) at your destination. Also renowned for its food. Through the Localism Act, the Government has introduced new powers for communities in England to nominate valued facilities such as pubs as “assets of community value”. Where pubs are listed this enables communities to “stop the clock” for up to six months if they’re put up for sale to consider options for saving the pub. With 18 pubs closing every week we need CAMRA members and branches to get involved in listing pubs before more of them are lost. So far two pubs in the branch have received this protection (both called the Royal Oak, one in Tunbridge Wells, one in Pembury). For a more in depth explanation of the what, why, and where please follow this LINK, which also contains an information leaflet.